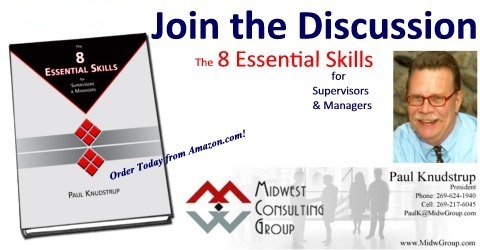 Shortly after the 1st edition of The 8 Essential Skills for Supervisors & Managers was published I posted some thoughts about one of the important roles you fulfill in the course of your work – Teacher and Coach. Based on the number of times that term gets searched on the blog, maybe it’s time to explore that a bit more. As a manager we can work with people whose skill level and job knowledge vary considerably. Particularly when the employee is new to the organization or your team, you are likely to be in a Teacher mode. You are teaching when orienting them to the team or the job; you teach them about the culture of the organization and the group. What do they need to know in order to be effective in their specific job and as part of the team? You teach them about the standards and expectations for performance, quality, communication, attendance, participation, and how much freedom they have to make decisions on their own. You make sure you give them plenty of feedback as they learn and progress. Once they demonstrate the appropriate level of competence in the basics of their job, you can shift toward more of a coaching role. The role of a Coach is different from that of a teacher and involves a different set of skills. At the highest level it requires a well-developed sense of awareness about each employee’s talents, skills, and needs. Knowing when an employee needs some encouragement and positive encouragement versus when they might need corrective feedback or bit of refresher training can involve some subtle differences. Asking open ended questions can help lead the employee to figure out what needs to done without you “telling” them what to do. Once the employee has successfully mastered the basics of their job you can increase the level of involvement they have in managing themselves. Obviously that doesn’t happen right away; you want to empower them but must do so purposefully. Beware the “aimlessly empowered!” Of course the two sides of this coin are not mutually exclusive. You will likely move back and forth on a continuum between teaching behaviors and coaching behaviors. What do you think? Are you teaching and coaching your people? Do you have a firm grasp of when to teach and when to coach with each personal on your team? PS – for a great take on the difference between Coaching and Feedback, see what executive coach Mary Jo Asmus has to say on the topic. You’ll find an excellent post on her blog at Aspire-cs.com. As she points out, Coaching is future-oriented while Feedback is focused on what has occurred in the past. She says, “In the end, coaching is about ‘letting go’ of advice-giving and assuming the person being coached is whole, smart, and understands the best direction to head in.” Good advice from one who knows. As a manager, how adept are you at knowing when it’s time to shift from Teacher to Coach?